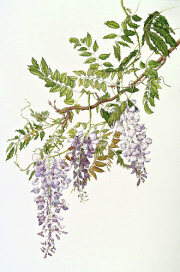 Originally called Glycinia, after the Greek “glykys” for sweet, renowned American naturalist Thomas Nuttall renamed the wisteria in the 1800s to honor Dr. Caspar Wistar (1761 – 1818), a professor of anatomy at the University of Pennsylvania, President of the American Philosophical Society, and a personal friend of Thomas Jefferson. 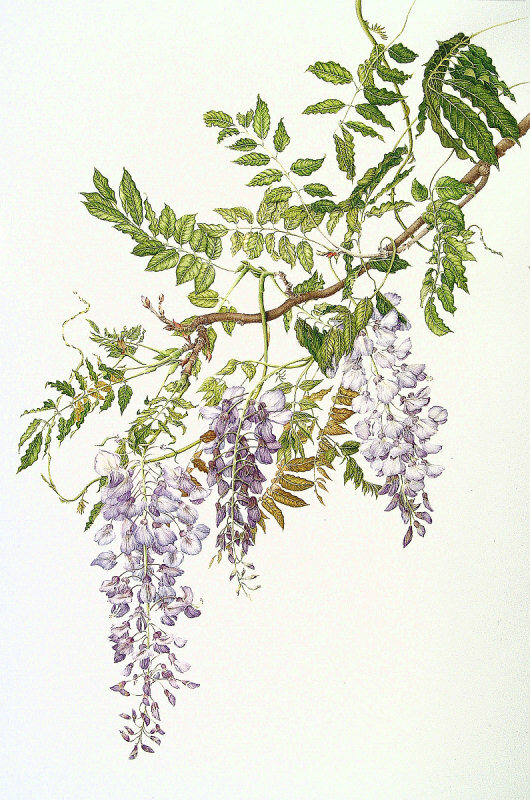 Chinese wisteria is a deciduous vine growing vigorously to heights of 25’ or more, has been known to destroy other plants, trees, supports and even houses, its delicate, long racemes of mildly-fragrant, pea-like, blue-violet flowers notwithstanding. In older vines stems become twisted, massive, with the heft and girth of tree-trunks. The blooms of May give way to pendant, velvety, bean-like seed pods which ripen in autumn and sometimes continue into winter. In contrast to the rather similar Japanese wisteria (Wisteria floribunda), Chinese wisteria twines counterclockwise, has fewer leaflets on each compound pinnate leaf, and slightly shorter flowering racemes. My studio was clouded with the delicate, pale mauves and lilac blossoms and their equally delicate faint perfume while they challenged me to portray them with paint and brush. Once severed from the parent vine, the dainty flowers detached themseves from their stems, raining down on my drawing table. It felt like an endurance feat, keeping up with their tantalizing behavior!